This volume is the third in the series of sourcebooks on Failure Analysis and Structural Integrity published by Elsevier. 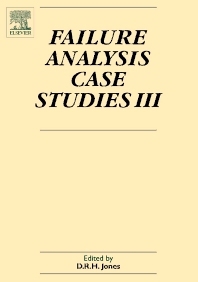 It comprises 35 case studies describing detailed analyses of real engineering failures and structural integrity problems chosen from volumes 7, 8 and 9 of the Elsevier journal Engineering Failure Analysis. It is an essential reference, helping people avoid or analyse engineering failures, design and manufacture for greater safety and economy, and assess operating, maintenance and fitness-for-purpose procedures. For professionals and advanced students in the fields of materials, mechanical, civil, aeronautical, manufacturing, chemical and corrosion engineering.